more things that i need want for summer! i love the pinafore from riverisland, and have been seeing so many bloggers wearing them and they look amazing, not too sure i could pull it off though - i may end up looking like an overgrown 5 year old ha. the revlon lipstick is perfect for summer and a gorgeous coral, and it's matte so will hopefully last all day! I actually tried on the mom jeans from topshop the other day when i was in there and i kind of liked how they looked on me - but i have no idea what shoes to wear with them, anyone has any suggestions? the flatforms, also from topshop, are so cute and i think will look great with a (fake) tan! and also add a bit of height because i am so short! The vichy dermablend foundation is something ive seen floating around youtube/blogger and i really want to try it out, apparently it has really good coverage which is something i look for in a foundation! So that is all for my wishlist, what things are you lusting over for summer? 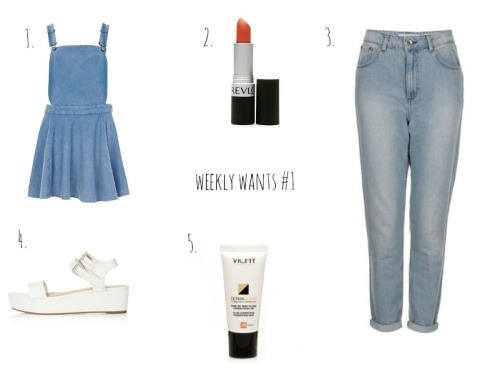 8 comments on "weekly wants#1"
The pinafore is just so adorable ! I can't believe I hadn't checked out your blog before- I just followed, it's really cute and you're so pretty! I'd love those sandals! Sooo pretty. Love the denim pinafore and shoes! Gorgeous picks - hope you Manage to get them all for this summer!